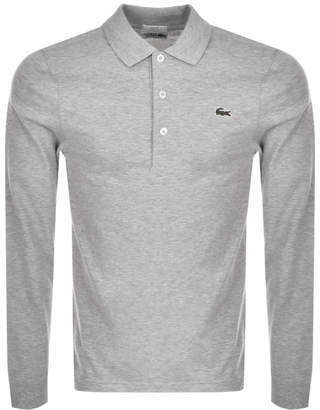 Lacoste Sport Long Sleeved Polo T Shirt In Silver Chine Grey Marl, Slim Fit. A lightweight pique fabric t shirt with a three branded pearlescent button opening at the neck and a ribbed polo collar. Long sleeves with ribbed jersey cuffs and the signature embroidered Lacoste Crocodile logo badge is situated on the left of the chest in green, white, black and red. Small side vents at the hem. 100% Cotton. Brand New Fantastic Lacoste T Shirts And Clothing Online.